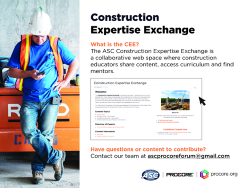 The Associated Schools of Construction (ASC) is the professional association of construction educators and industry practitioners working together for the development and advancement of construction education. It promotes the sharing of ideas and knowledge and inspires, guides and promotes excellence in curricula, teaching, research and service. The ASC is made up of 8 regions; 7 regions from the United States and Canada and one European region. There are 143 4-year Construction Management programs of member universities and 9 2-year member schools. Graduates from these institutions fill entry-level positions as project engineers, estimators, safety managers, superintendents, BIM managers, pre-con, document control and communication positions, schedulers, etc. What is the ASC Annual Conference? The ASC Annual International Conferences provide opportunities for faculty members from Construction Management programs and industry practitioners join together to discuss up-to-date curricula, best teaching practices, current management models in the construction industry, present research findings, to learn from each other, and to hear from industry and related professionals. The conferences are held in various sites and are usually located near the hosting university.